Nettles sting with the little hairs under their jagged, heart-shaped leaves, and on their stems. They don’t sting once they are boiled. They usually do not sting once dried, but be careful, as I have been stung by dried nettles. What stings is the formic acid and histamine on the hairs. Harvest the tops of nettles with scissors, gloves, and caution. 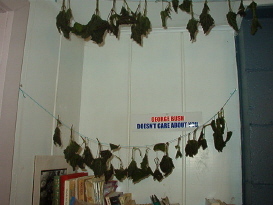 You can put string up between two corners of your home and hang the nettles up to dry. Once dry, store in containers for later use. Nettle vinegar can be made by soaking fresh herbs in white vinegar. The vinegar leaches the calcium and other minerals out of the nettles, and then you can sprinkle the vinegar on salads, veggies, stir fry, and it will be nourishing. Purple nettles will tint the vinegar a nice rose hue. You can steam young nettles picked in spring, just like kale or spinach. Use the leftover water as a hair rinse. You can add the leaves to soups, stews, and basically any recipe calling for spinach. Nettles are reportedly high in calcium, iron, magnesium, chromium, potassium, and zinc, as well as vitamins A, B, C, D and K. Nettles are said to nourish the adrenal glands, and are also rich in carotene. Nettle tea has been used traditionally as an arthritis treatment as it supposedly breaks down uric acid crystals in joints. Nettles supposedly also help expel mucous during colds, as well as being a diuretic. 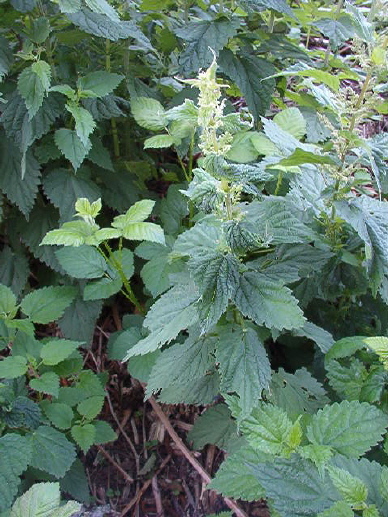 In Germany, the government has approved nettles as a treatment for urinary retention. Nettles have been traditionally used to treat asthma, anemia, itchy skin, kidney and bladder infections and stones, diarrhea, dandruff, to rehydrate vaginal tissues by drinking the tea and using it for sitz baths also, and as a general tonic. Nettle tea also makes a delicious, nutritious drink just to sip. Roman soldiers stung themselves with nettles to keep warm in the cold winter. Some people sting local areas with nettles for arthritis pain, saying once the initial sting wears off, they find arthritis relief for hours. In the past, people have inhaled powdered nettle leaves like snuff to stop nosebleeds, as the astringent properties are said to help external and internal bleeding. 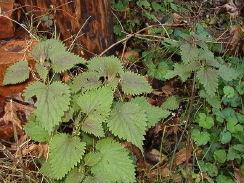 Nettles reportedly curdle milk, and was used in cheese making in Judea. Nettles also make a nice yellowish-gray-green wool/silk/cotton fabric dye when mixed with alum. There are warnings that ingesting large quantities of nettles can cause constipation, stomach ache, skin burning and urinary problems. 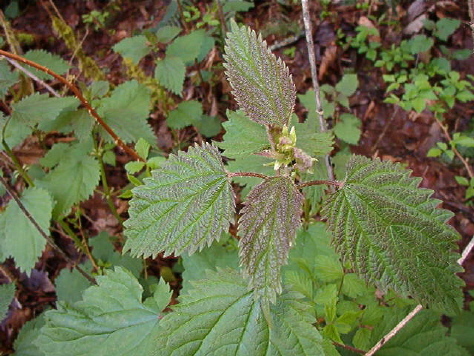 Nettle fibers have been used to make rope, cloth and paper. Some people make nettle beer. As you can see, nettles are some useful plants. Wild plants do not cost money. They can be hand-harvested, hand-dried, and used for better health and beauty, for free. As Americans raised in cities, most Americans cannot identify basic wild edible and medicinal plants. This is a shame. To reconnect with the earth, pick nettles to help you appreciate the gifts the earth gives us, and remind us we need to protect the earth. Use nettles to replenish your blood and tissues. Take some time out in the sun to harvest plants in the woods. It is anti-capitalist. It is empowering. It is FUN and it is FREE!